Although asymptomatic nonossifying fibroma is an active lesion that persist and enlarges throughout childhood. 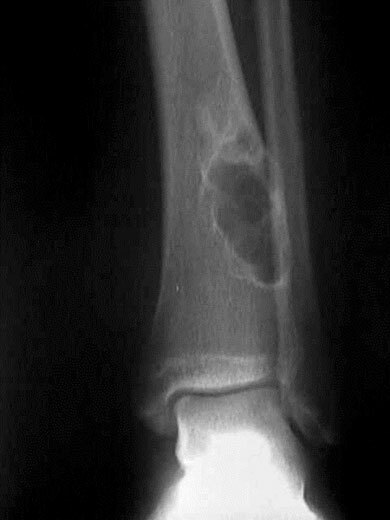 Pathological fracture can occur, when the tumour occupies more than 50% of the diameter of the bone. With skeletal maturation non-ossifying fibromas becomes inactive or latent and ultimately ossify. Macroscopically composed of soft reddish tan, granulation like tissue. Dense collagen arranged in a storiform pattern. A more or less oval radiolucent area surrounded by a thin margin of dense bone. It is actually adjacent to or within the cortex; hence the alternative name is fibrous cortical defect. Intracapsular curettage supplemented with bone graft or other stabilizing technique can be done.